Thistles Shopping Centre, Stirling has announced musician Chris Russell as the latest star recruit to its #STIRLINGSHINES campaign which celebrates the achievements of inspirational talent. The 30-year-old who lives in Stirling is no stranger to the spotlight. As the resident pianist of Rusty’s Travelling Piano Bar, the UK’s first ‘musical reception on wheels’ which he founded with wife Billie, a professional chef and marketing guru, Chris knows the ingredients for a memorable celebration. Having grown up in a musical family – his mother performs with Scottish Opera and his father with Leeds Opera North – Chris along with younger sister Pauline, who also works at Scottish Opera, was immersed in set productions and rehearsals from a young age. This exposure to creativity has clearly stood him in good stead for a career as a professional musician. Whilst studying Music at Strathclyde University, at the age of 18 Chris was invited to join Scotland’s renowned Red Hot Chilli Pipers. 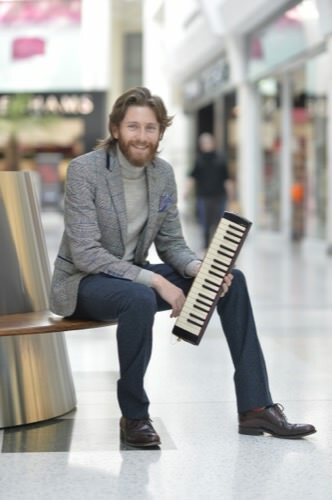 Playing piano in the trailblazing band for 4 years saw him tour the world and headline barnstorming sell-out gigs in the US, China, India, South Korea and Europe, as well as the biggest music festivals including T in the Park, RockNess, HebCelt and Lorien. Indeed, it was at a festival that the ‘cosy musical bar in a horsebox’ lightbulb moment happened. Through the Princes Trust network, Chris and Billie were able to bring their idea to life. As well as touring a busy diary with Rusty’s, Chris performs with the incredible Killer City Sound, the 5-piece band that has rocked the infamous Gleneagles Hogmanay Party for 4 consecutive years now. He is also working on a new album with his band, The Byson Family who are performing with rocker Phil Campbell at St. Luke’s in Glasgow on the 18th December. To find out more about #STIRLINGSHINES and share your story about a local hero, visit www.thistlesstirling.com.